Smoked salmon is quite the indulgent treat. The salmon is salty, smooth, and slightly sweet. But I like my cold smoked salmon sautéed! I always cook it just for a few seconds in a little bit of butter just so I'm sure it's completely safe. If you like yours as-is, you don't have to do that. You could use hot smoked salmon in place of the cold. It is cooked, so you don't have to worry about food safety. Hot smoked salmon is firmer, though, with a more pronounced flavor. These little sandwiches are just delicious. The smoked salmon is combined with basil, cream cheese, and mayonnaise, then the mixture fills flaky little croissants, accented with whole basil leaves. These sandwiches are perfect for brunch or for a ladies' luncheon (do those exist?) on the porch. Serve with some iced tea and mixed fresh and sweet berries, with some Lemon Bars for dessert. The sandwiches are also nice as part of a cold sandwich tray for a buffet or for a party. This recipe can also be served as an appetizer spread or dip. Serve it with crackers and crudités such as baby carrots, mushrooms, and bell pepper strips. To serve as a dip, thin the cream cheese mixture before you add the salmon with some whole milk or heavy cream. You could add more ingredients to this recipe; think about adding some sliced green onions or caramelized yellow onions. Sautéed garlic would be a good addition, as would some capers or finely chopped sweet or dill pickles. Separate the salmon into individual slices. Heat butter in a medium skillet and sauté the salmon until it is done, turning once, for just a minute or so. You can skip this step if you prefer to use the salmon uncooked. Break the salmon into pieces. If you aren't cooking the salmon, cut it into pieces with a sharp knife. In a medium bowl, beat cream cheese with an electric mixer until soft and fluffy. Beat in mayonnaise until smooth. Stir in the salmon and dried basil. 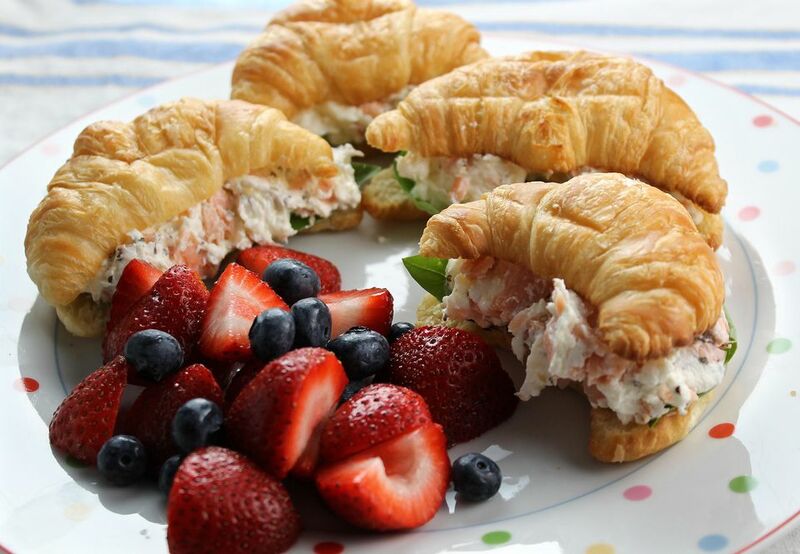 Make sandwiches with the salmon filling, the whole basil leaves, and croissants. Serve immediately. You can make the filling ahead of time; just cover it well and store it in the refrigerator up to 3 days. Use it when you want as a sandwich filling or for a snack with crackers.